Even if I didn’t have a calendar, I would know it was fall from the autumnal projects in the kitchen. In the market, there are pole beans and some shelling beans, a few chiles and peppers, potatoes, onions, leeks and fennel. Squashes and cauliflower. Kale and chard and spinach. The pantry is packed with jars of tomatoes and grape juice, dozens of different jams and jellies, pickles and pie fillings. 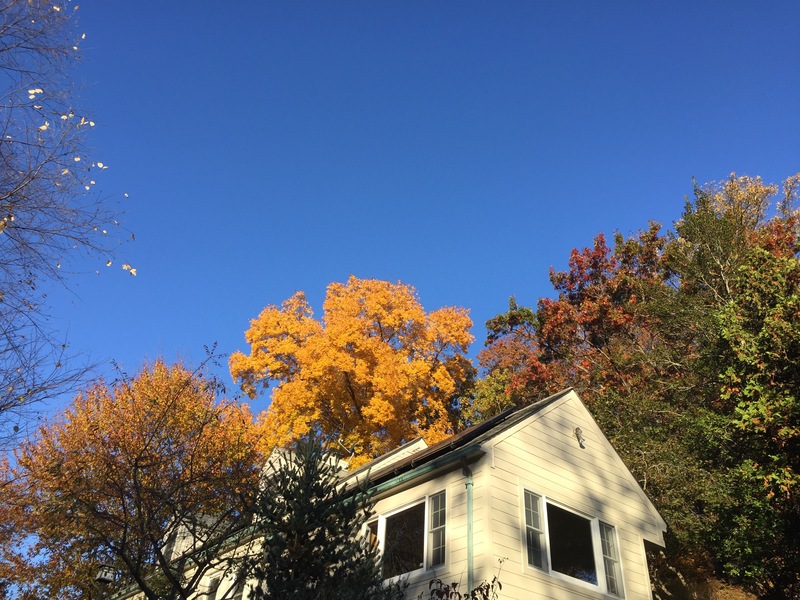 For me, these weeks before Thanksgiving are full of activity. This year, instead of pushing through the last round of edits, or just back after from 22 grueling book tour days. I will be home for the holidays. I’m going to bring back some old traditions and create some new ones and I’m using the next four weeks to get ahead of the game. There’s giardiniera, the cruciferous salad that appears on my table day after day, smacking of both crunch and color. I recommend making a batch especially for Thanksgiving. It’s a great condiment and foil for all the rich food. 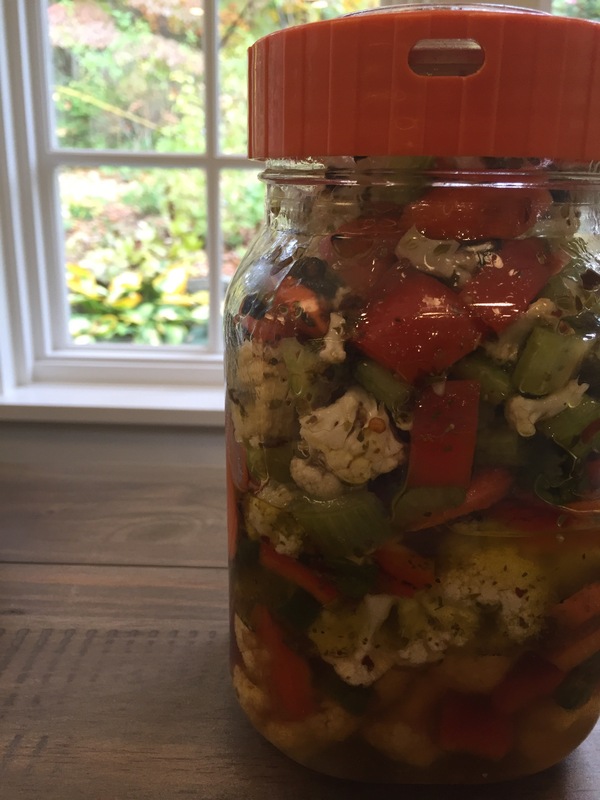 Keep in mind, Giardiniera takes three or four days to brine and holds in the refrigerator for about three weeks. Take advantage of the greens in the market and freeze packets to use later in the winter. Add to frittatas or soups, smoothies and ravioli. I wrote a Washington Post Food Section article on freezing greens. Why buy frozen greens this winter when you can freeze local greens now? The real work began two weeks ago with the freezer inventory. Not only do I need to get a handle on what is filling TWO freezers, but I need to make room so I can do some make-ahead for Thanksgiving. With a spectacular lamb shoulder (special order from Whitmore Farm), I made merguez. We have shakshushka about twice a month, and while Dennis enjoys a vegetarian version, I’ll add a little merguez patty to mine. You can bet I made it that night, even though I know the flavor of merguez improves after resting for a day or two. Evidently, I have been hoarding leaf lard, the very pure white and flavorless fat that surrounds a pig’s internal organs. I found three large packages in the freezer. I cut it up, still mostly frozen, then ground it through the coarse disk of the meat grinder. I added a cup of water when I got started, to make sure it wouldn’t burn and for three hours on low, the fat melted in the slow cooker. As the water boils away, the fat renders (melts). It’s so easy. I’ve strained the fat and have it stored in jars in the refrigerator to use instead of butter or shortening in pie crusts and biscuits. Thanksgiving pies coming up! I now have 15 quarts of chicken stock, canned and on the shelf, from the countless bags of chicken carcasses, wing tips, backbones, necks and feet that I threw in the pot with carrots, celery, onions, bay, thyme and parsley. That’s like money in the bank with soup season coming. After I added a couple of peeled apples to butternut squash soup (and finished with a big scoop of miso, then blended until smooth), I infused bourbon with the apple peels and a cinnamon stick, an idea Marian Bull wrote about last year. I made it once earlier in the fall and it was very, very good. It’s not all savory all the time around here. 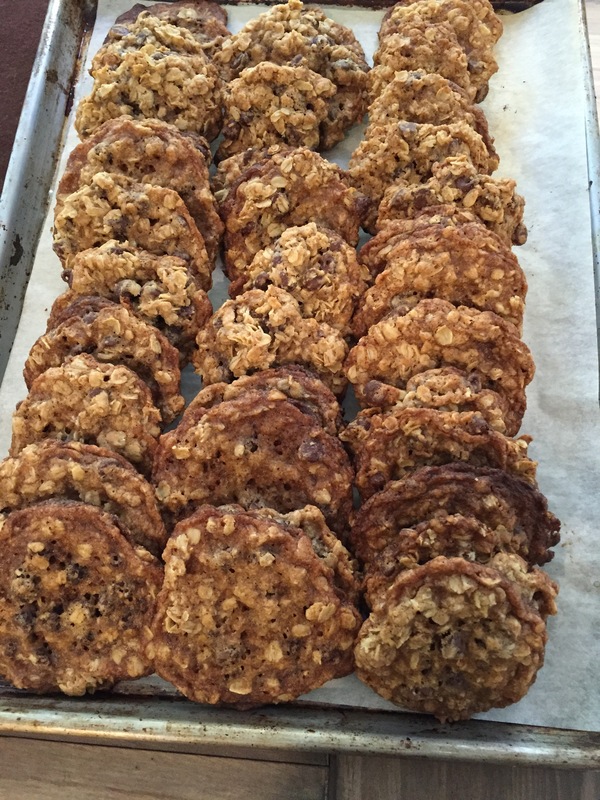 I’ve been slightly obsessed with these Crispy Oatmeal and Chocolate Chip Cookies from Food52’s Merrill Stubbs. They’re positively delicious. I took them to a party last week and they were gone almost before the platter hit the table. What are you doing to get a head start on the holiday season? Slice the lamb shoulder into long strips and add to a large glass, ceramic or stainless steel bowl. Add the garlic, ginger, spice mix, harissa, tomato paste and salt. Stir well, cover, and refrigerate for at least an hour, or overnight, if possible. Place the meat grinding equipment — the worm, disk and blade — in the freezer at the same time so it’s cold when you’re ready to grind. 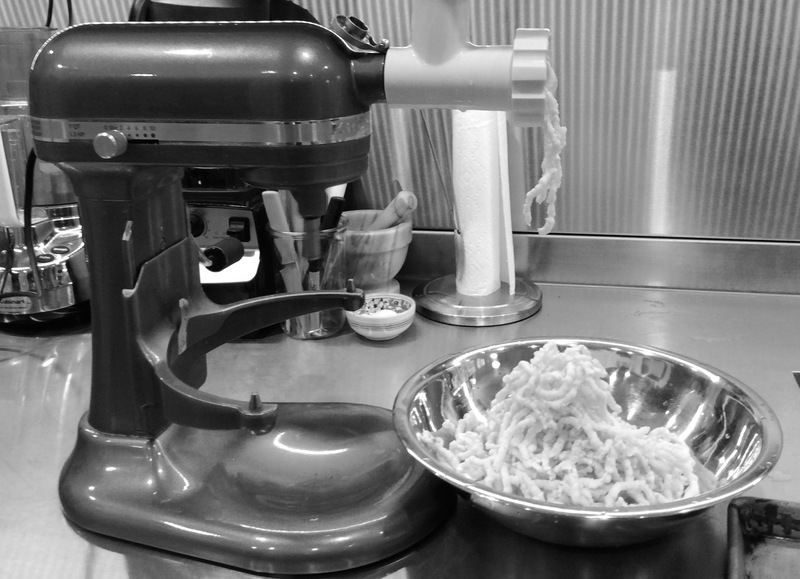 Assemble the grinder and place a large bowl below the feed tube to catch the freshly ground meat. Feed the lamb and all the other ingredients through the feed tube into the bowl. With a broad wooden spoon or the paddle attachment on a stand mixer, beat the sausage mixture until myosin forms and it makes a thwapping sound. If it will not come together, add a tablespoon of very cold ice water. Do not overbeat. Form a little patty and cook it. Taste and adjust the harissa, salt, pepper until you are happy, mixing and testing a patty each time. Dip your hands in ice water to form patties. I like to measure out 2 ounce portions with a large ice cream scoop. 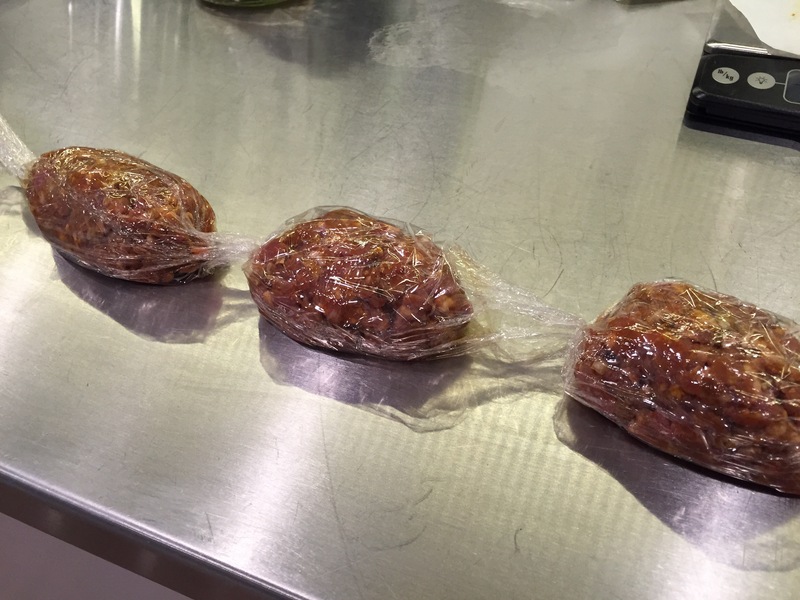 Line the patties up on a long piece of plastic wrap. Chill for a day or two before using to improve the flavor. 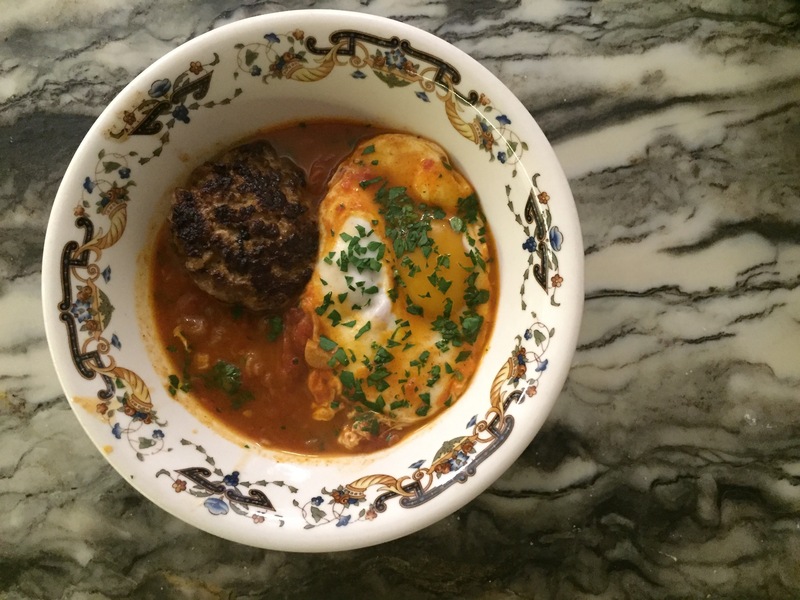 I love to serve merguez in the shakshushka that follows, but they are also great in a pita with tsaziki or atop lentils with a bright, sharp salad on the side. Combine all the ingredients and grind fine using a spice grinder or a mortar and pestle. Store in a glass jar. I keep the spiciness on the mild side in this version of this classic middle eastern dish. 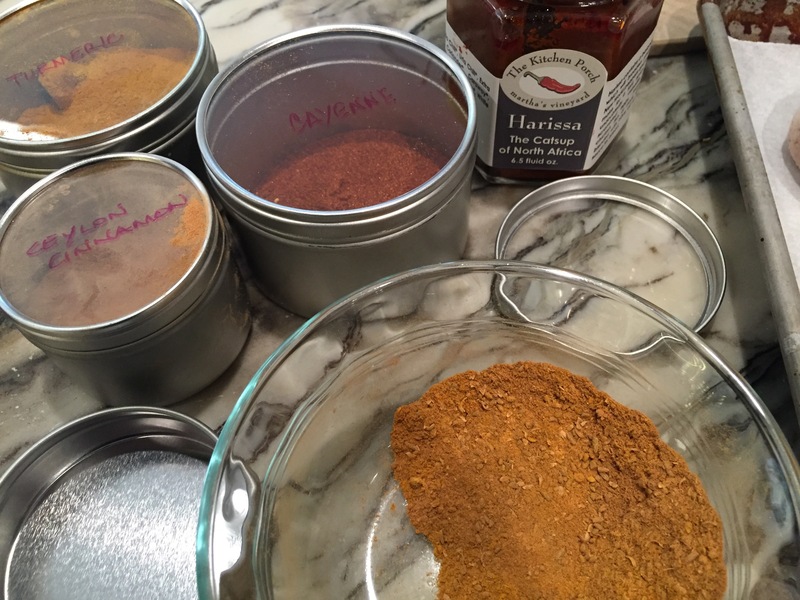 For more heat, increase the smoked paprika and add a couple of pinches of cayenne. In a large cast iron or other heavy straight sided skillet, heat the oil over medium heat. Add the onions and cook until translucent. Add the garlic, ras el hanout, paprika and salt and cook until fragrant, just a minute or two. Add the crushed tomatoes and bring to a simmer. Simmer until thickened, about 5 minutes. Heat a small saute pan and fry the merguez patty until fully cooked, about 4 minutes per side. Just before the merguez is finished, break the eggs into the tomato sauce one at a time. Make sure the sauce is simmering so the eggs poach in the sauce. They will be cooked, with a runny yolk, in about 3 minutes. Serve in wide deep bowls. The vegetarian gets two eggs. The carnivore gets one egg and one merguez patty. This grasshopper needs to take a lesson from your industrious ant! I am most dreading the freezer inventory. The findings always fill me with equal parts shame and “WTF is this?” Your shakshushka looks divine!! Those recipes sound just right for now. I am not so much preparing for the holidays (being the only far-flung family member, I travel and take a break from the kitchen), but I am madly preserving fall’s bounty: quince preserves, kim chi, pickled turnip, and processing the last of my garden’s peppers. Thank you for the merguez recipe! I am also a vegetarian, but I have been wanting to approximate the spicy sausage for recipes. I’ve been wondering about the news about processed meats–what do all the Italian octogenarians know that we don’t? Do you think it’s all the vegetables and wine they consume that counteracts the meats, or are traditional European sausages processed in a different way? Hello! Every time I read your posts and all the wonderful food that you create AND can, I think, I CAN do this but then chicken out and get overwhelmed thinking about the whole canning process. Right now I have a broken foot with no weight bearing, but I can get to our local bookstore and buy your book, read it thru again, (checked the book out at the library the first time) and get ready for the Spring bounty. I adopted my twin grandchildren and am getting ready to retire in 2 years so I will need lots of money saving ideas. Thank you for a wonderful column!! !